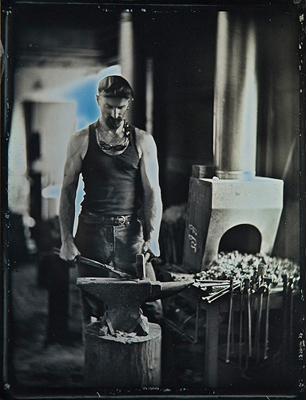 Daguerreotype by Mike Robinson, 2008. A deep interest in history and archaeology brought me to the medium of metal. So much of what we know about the past comes from small, precious objects of function and beauty. I look forward to leaving a legacy of my own stories. BFA degree at Maine College of Art, Portland, Maine, May of '93. Senior thesis: An Exploration in Niello. Diploma, South Lakes High School, Reston, Virginia; active in various art programs, 1989. Montgomery, Maryland from Feb '89 to May '89. Collaborative Member, Arctic Fire 2016. Guest Speaker, Champlain College. "History, Mythology, Science and the Artisan." Documenting Vendel to Viking Blades & Pattern Welding Consulting, University of Uppsala. Collaborative Member, Arctic Fire 2013. Documentary Film: Artifacts From the Present. Guest Presenter, Arctic Fire 2012. Topic: Making and Applying Niello. Art & Jewelry Instructor, U-32 High School. January '09 to June '12. Visiting Instructor, Viking / Migration Era Pattern-Welding. New England School of Metalwork. Visiting Instructor, Bladesmithing. Peter's Valley Craft School. Summer '06, '07, '08, '09 & '11. Guest Speaker, Champlain College. "History & Mythology as Artistic Inspiration." the magazine of Vermont Independence. January '05 to January '07. Moderator for the Custom Knife Directory's General Knife Discussion Forum. Moderator for Custom Knife Directory's Historical Inspiration Forum. dedicated to sharing and exchanging information; Summer '99 to present. Visiting Artist, teaching Jewelry classes at Shelburne Craft School, Shelburne, Vermont. Fall of '97 to Fall '98. July of '94 to Jan '99. at the Washington Crafts Expo, Washington D.C., November of '92 and again in November of '93. Same position at the Ninth Annual Crafts Park Avenue, N.Y.C., October '93. Benchwork/Sales for Samuel Shaw Contemporary Jewelry, N.E. Harbor, Maine, Summer of '93. Seasonal position. Teaching Assistant at Maine College of Art Pre-College program, Summer of '92. Teaching Assistant at Maine College of Art Saturday School program, Fall '92 and again Spring '93. Teaching Assistant at Maine College of Art Continuing Studies Adult Education program, Spring of '93. The Serpent in the Steel, Solo show. Grannis Gallery, Burlington, Vermont; November '07. New York Custom Knife Show, NYC. Blade Show 2002, Atlanta, Georgia. Baltimore / Timonium Show, Timonium, Maryland; 2001. North East Cutlery Collector's Association Knife Shows; 2001, '02. Past & Present, Samuel Shaw Gallery. Northeast Harbor, Maine; Fall of 01. Night of 1000 Scars. Custom Jewelry. Bodyart and Performance celebration at NYC's Webster Hall; October 1, 1997. Jewelers & Photographers, Maine College of Art Alumni. Davidson and Daughters, Portland, Maine; Spring of '97. Custom Jewelry, Modern American Body Arts. Brooklyn, New York; Fall of '97 to '00. Metals in Motion: A New Generation. Fibula Gallery, Portland, Maine; Spring of '93. Senior Show, Graduates of Maine College of Art; Spring of '93. Senior Thesis Exhibition, Maine Coast Artists, invitational; Summer of '93.